Evidence Mounts On Shortcomings In Whooping Cough Vaccine : Shots - Health News There were more than 9,000 whooping cough cases in California in 2010, a 60-year high. There has been a resurgence of the disease across the country lately. Why? People going without vaccination is one factor. Another may lie in the vaccines themselves. 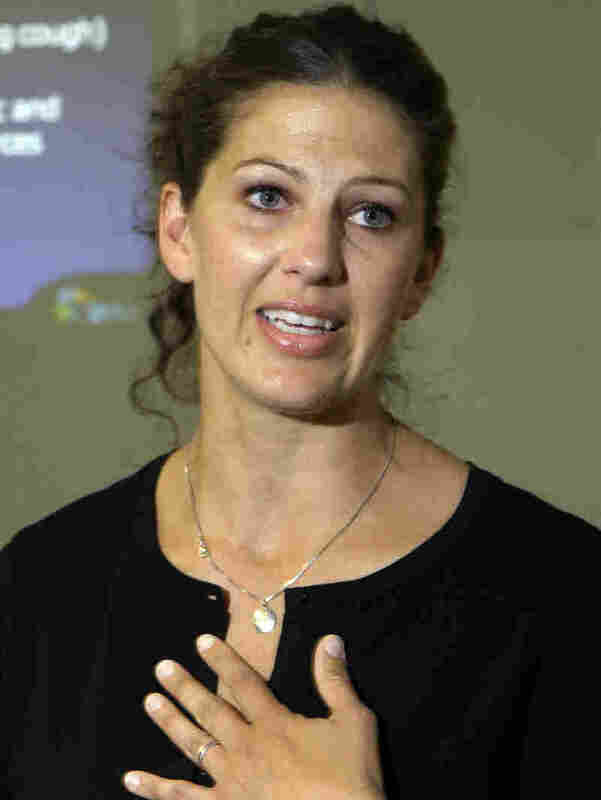 At a Los Angeles media briefing in 2010, Mariah Bianchi describes how her own case of whooping cough caused the death of her newborn son. Whooping cough went on a tear in California back in 2010. There were more than 9,000 pertussis infections in the state, a 60-year high. In recent years, there has been a resurgence of the disease across the country. Some people aren't getting immunized. And it's also probably the case that more sensitive tests and greater awareness of whooping cough are spurring doctors to do a better job of diagnosing it. Another factor may be that the vaccines kids get to protect them against the respiratory illness appear to be losing their effectiveness faster than expected. Results from a study that compared California kids who got whooping cough with some who didn't adds more weight to that hypothesis. Kids are supposed to get three doses of the so-called DTaP vaccine (against diptheria, tetanus and pertussis) at two, four and six months, followed by booster shots at 15-18 months and 4-6 years. The study of California kids found that those who had been fully vaccinated were less likely to catch whooping cough. But the study also found that the more time had passed since children completed the five-shot immunization regimen, the more likely they were to get whooping cough. Overall, the effectiveness of the pertussis regimen fell from 98.1 percent within a year of finishing it to 71.2 percent five or more years later, according to estimates by the researchers from the Centers for Disease Control and Prevention and the California Department of Public Health. The results appear in the latest JAMA, the Journal of the American Medical Association. The current vaccines, introduced in the late '90s, have fewer side effects than the older versions. But, it appears, they may not be as potent. Now, it's true that this study, which looked at sick kids and comparison children after the fact, found associations and can't prove causation. Still, the researchers conclude that vaccines that provide longer-lasting protection may be needed to better control whooping cough. An accompanying editorial says that although the current vacccines "may be suboptimal, they are still quite effective." Because infants are the most vulnerable to serious illness and death from whooping cough, the editorial emphasizes immunization of pregnant women and people who will be in close contact with infants. The latest results jibe with a Kaiser Permanente study published in the New England Journal of Medicine in September. It found that whooping cough vaccines' effectiveness faded, too, falling more as the years dragged on.